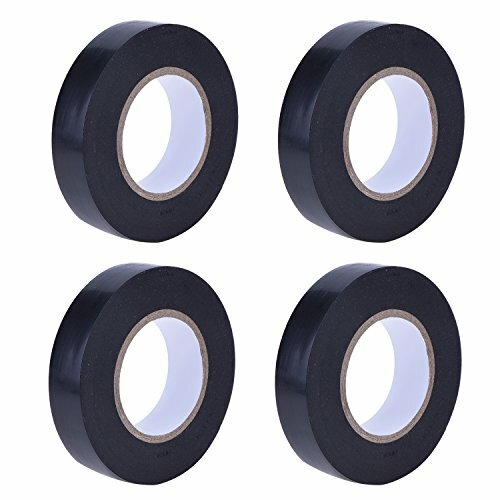 4 Pack black electrical tapes in 1 set; The size of electrical tape is 50 feet long and 0.6 inches wide; Each one weights at 1.78 ounce. The electrical tape is made of PVC; Film as substrate, coated on rubber pressure-sensitive adhesive; Good quality tape with low lead and cadmium content. The electrical insulation tape has good insulation, pressure resistance, weather resistance and acid and alkali resistance. The waterproof electrical tape can easily wrap around sharp edges and stays tight with good adhesion. Electrical vinyl tape is suitable for using in most electrical and mechanical applications such as cable insulation, wire bundling and reinforcing; Fit for indoor and outdoor.